Catch up on the story! Read Part 1, Part 2, and Part 3 of The Zoo Changes. Losing Snowy was a tragedy. 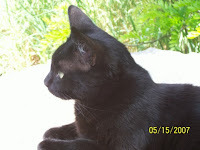 She really was the most fantastic pet Little A has ever had. Snowy was so dear to all of us, that we all are still feeling the loss of her presence. We did immediately take the little kitten (who is still thought of as a killer, even if it is in cats' nature to hunt small furries like hamsters) back to our friends. They had told us to bring it back if it didn't work out. One kitten back out of the house. Little A was so upset that he wanted to get rid of our sweet, hamster babysitting Nora and her kitten too. He never wanted to see another cat again! We spent a good deal of those 5 hours that night tapping (using EFT - Emotional Freedom Techniques). We tapped on every issue of wanting to kill the killer of Snowy that came up. We tapped on Snowy being dead. We tapped on the responsibility that each of us felt for her death. We tapped on never finding another hamster that would play with Little A like Snowy. We must have done a really good job tapping, because the next morning.... We woke up with Little A wanting to go and get the kitten again. After all, it was just instinct that it attacked and killed a hamster. 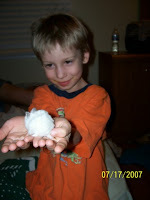 We reminded him of what had happened, and how dear Snowy was to him and all of us. We talked about what he really wanted to have as a pet. We talked about, and used EFT (Emotional Freedom Techniques) on, his need to rescue every animal he saw and take care of it. 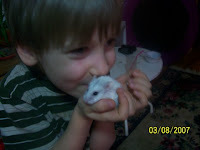 And he finally came to the conclusion that he really did want our sweet little Nora, and a hamster like Snowy. So, off to Incredible Pets we went... rumor had it that they had an orange and white hamster, and we wanted to see it. I told the kids that I was just getting ONE dwarf hamster. I was open to the possibility of a different small furry animal though. You see we all seem to suffer from the “I have to save every animal I see” syndrome. Pet stores can be very dangerous places for our family, and very expensive! he fell in love with it, it curled up in his hand, it climbed up to his shoulder... The B couldn't find any other dwarf hamsters that she liked. We got home just before the people were supposed to come pick up the dwarf hamsters and cages we were giving away. Seems ridiculous to be giving away these small furries because they were too much work, and be bringing home different ones instead! But the dwarf hamsters were male, so it is only one cage to clean. 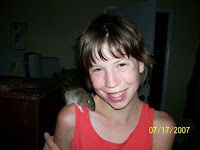 And The B was so taken with the rat, I couldn't say no. And so we said goodbye to Nibbles and Sunny. And we set up new homes for the new Snowy, Cutie, and the rat Ashes. It has been a busy couple of days! Everything was going really well. The boys loved their new dwarf hamsters. They love the fact that they curl up together, and run around the tubes together. 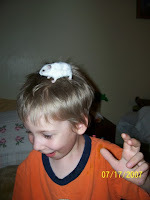 And the boys take out the dwarf hamsters to play with in the Imaginext Adventures Castle Playset, to drive through the house in trucks, and to watch movies with them. The boys are happy again. The B loves the new rat. She has named it Ashes. Ashes is so friendly and playful. He loves to climb on her shoulder and do everything with her. The B is happy again.